Those new to the Desert Southwest are often surprised to learn that Arizona offers some of the greatest diversity in plant life, animal life, and insect life in the United States. In fact, only Texas rivals Arizona in terms of number of species that can be seen. While I love to travel to interesting locations in Southern Arizona, it is also very satisfying to attract interesting insects and birds to my backyard. And what better way to take advantage of our inherent diversity than to try to attract some of it to our backyards! In fact, bird and butterfly gardening largely relies on native, drought tolerant plantings that serve to improve habitat and offset some of our homes impact on the natural land. Today we're focusing on butterfly gardening. While butterfly gardening is relatively easy, I’ve found that many new to butterflies get discouraged at some point for a few reasons. They expect to have many large butterflies, like Monarchs and Swallowtails. The reality is that most butterflies and much smaller and much more inconspicuous. Gardeners tend to overlook larval food plants. As you’ll see below, some of the best attractants of butterflies are not flowers themselves, but rather the leaves. 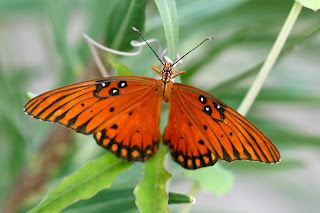 This article is going to look at the most commonly recommended desert butterfly plants, some of which I’ll highlight as the “all-stars” of butterfly gardening. But first, a quick lesson in butterflies. 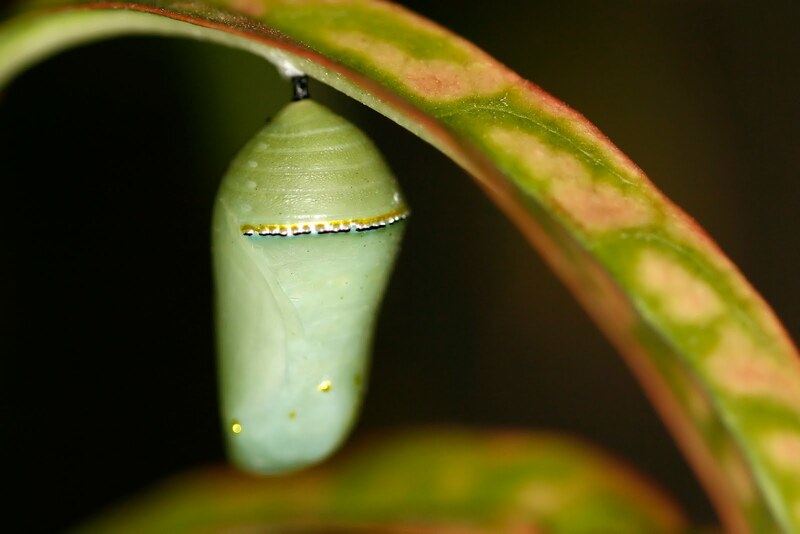 Butterflies begin their lives as small eggs, usually laid on a larval food plant that the specific butterfly prefers. Occasionally, eggs will be laid near a larval food plant, but the theme remains – adult female butterflies seek out a specific plant of family of plants for their eggs. Eggs hatch and a caterpillar emerges. The caterpillars are often strikingly colored, and may be as much fun to observe as the butterflies themselves! Caterpillars are known as eating machines – they may even eat their egg shell along with the leaves of the larval food plant. Caterpillars may be tiny when they hatch, but as they grow they shed their exoskeleton – sometimes as many as 5 times. Caterpillars take a few weeks to grow to full size before they enter their next stage. Caterpillars themselves are very interesting to observe, as I showed with these Queen caterpillars. 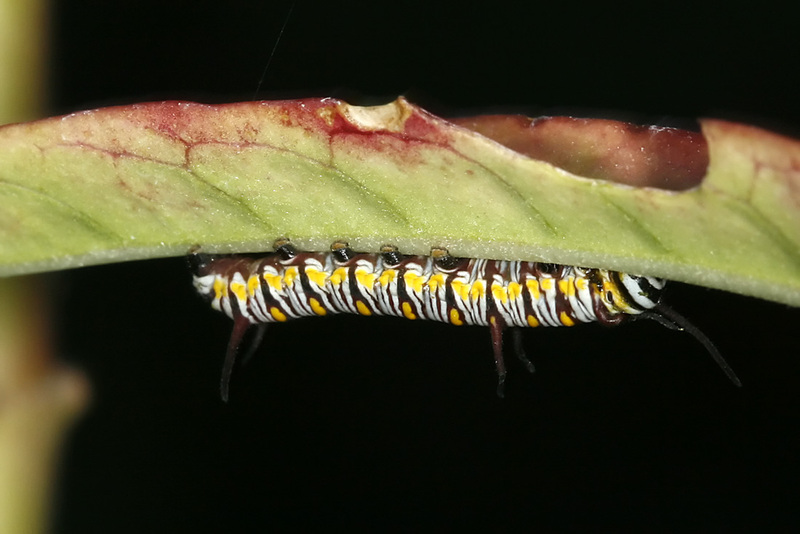 Caterpillars locate a place to pupate. This may be on the larval food plant, or nearby. The caterpillar sheds its skin and forms a chrysalis – a pupal case that some people call a cocoon. Note, however, that cocoons are unique to moths, not butterflies. The chrysalis can also be strikingly colored and very interesting – especially if viewed with close-focus binoculars or a magnifying glass. After a few days to a couple of weeks, the adult butterfly emerges from the chrysalis. Most adults will only live a couple of weeks, but they make the most of their time and may mate multiple times. Different butterfly species will be observed at different times of the year. Some butterflies are migratory (like Monarchs), while others simply prefer certain weather conditions. In some cases a given species will emerge and be most prevalent when their larval food plants are at their peak. In Arizona, a good backyard butterfly garden may attract 25 species of butterflies or more throughout the year. It is important to be observant. The tiniest of butterflies are easily overlooked, and many butterflies will be inactive during the majority of our hottest days. Generally speaking, if you see a butterfly or moth like creature flying in the daytime, it is a butterfly. Close inspection will reveal some other general differences. For example, butterfly’s antennae usually have a club-like knob on the ends. As mentioned above, butterfly caterpillars form a pupa, while moth caterpillars spin a silk cocoon. Since moths fly at night, they usually have a hairy body, thought to conserve heat. As with any generalization, there are exceptions. It is highly recommended that the butterfly gardener purchase a butterfly guide, such as the Kaufman Field Guide to Butterflies of North America. These guides will provide insight into shapes, sizes, and behaviors of butterflies, and also provide range maps to give you an idea of what to expect. Good guides indicate which plants a species will prefer, and times of year they are most likely to be “in-flight” in adult stage. 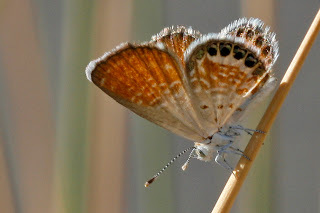 That aside, be aware that many southwestern butterflies are very small – some as small as your smallest fingernail like the Western Pygmy Blue shown here. Despite the miniature size of some species, they can be quite colorful, especially when viewed with close-focus binoculars or a magnifying glass. However, we also get our share of very large butterflies as well, including Swallowtails, Queens, Gulf Fritillaries, and even an occasional Monarch. Note that some butterflies take on different postures. Skippers, for example, look much more moth-like than species traditionally identified as butterflies. I’ve become firmly convinced that larval food plants are as important, if not more important, than nectar plants. The larval plants attract adult butterflies to lay eggs. Further, some adult butterfly males “stake out” larval plants hoping to find a female. Not to mention that it is great fun to observe caterpillars and watch a butterfly life cycle. A good butterfly garden has a mix of larval food plants and nectar sources. In both cases, it is good to plant multiple plants of a given species. This is especially true of nectar sources, where a mass of a given plant may catch the attention of butterflies. And note that not all flowers produce nectar, which is where the list below helps. Your butterfly garden should insure most of the plants are in full sun, or close to full sun. Brightly lit flowers seem to be a strong attractant. However, it is also key to have some shade in and near your garden. Butterflies must regulate their temperatures, and need places to “cool off”. Some butterflies like to “eat” salts, water, and other minerals from mud, as well. This is a common behavior sometimes called "puddling". If you have micro-sprayers in your irrigation system, you may wish to make a small clearing where butterflies can come to visit the mud. As an example, when I dump my daughters wading pool, within seconds I have American Snout butterflies that were "hiding" in my Desert Hackberry show themselves and soak up the water and minerals. If possible, create two or more areas in your garden focused on butterflies. Given that the list of preferred plant species ranges from trees to groundcovers, and shrubs to grasses, it should be easy to create a yard full of butterfly attractants. Lastly, use pesticides sparingly, if at all. All-star! Also great bird planting. Large shrub. Parsley is said to work well, too. Consider this one carefully - plants are very toxic and flowers smell odd. Best for acreages and away from children. White flowered nectar source; densely flowered groundocver/low perennial, but relatively short-lived - about 2 years. All-star - it is also a larval food source for Dainty Sulphur. I've tried to avoid any invasive plants, though keep in mind that "invasiveness" can vary depending on your environment. With all that in mind, a few others that didn't quite make the cut, but would function well supplementing the above include shasta daisies, Mexican sunflower, cosmos, snapdragons, and marigolds. In fact, even Russian Thistle (yes - the non-native tumbleweed) is an excellent larval food source for Western Pygmy Blues (though I wouldn't recommend growing it on purpose). So if you have a nearby vacant lot or neighbor that lets their weeds run wild, at least take solace in the fact that those thorny tumbleweeds are providing a food source for some butterflies!